Prawns in the Alps? Perhaps a bit of a left-field choice given the significant lack of water around these parts. However as it turns out we can get our hands on some nice big juicy prawns during the winter. 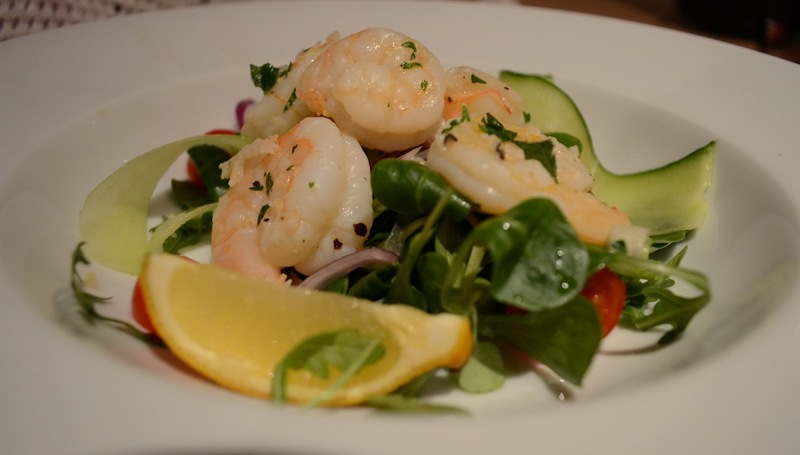 Here is our recipe for our spicy prawn salad that we serve as a starter at The Tasty Ski Company. It is simple and delicious and really goes down a treat – it relies on the balance between the heat of the garlic, chillis and paprika, along with the freshness of the lemon juice. lemon juice to taste plus an extra wedge per person. Add the butter to a pan and heat up until it starts to sizzle. Add the chillis, garlic and paprika to the pan and heat until the garlic starts to go golden brown (2-3 minutes). Add the prawns and heat until they are just cooked through. Do not overcook or they will become chewy. Remove from the heat and season with salt and lemon juice. Add the parsley. Use a peeler to make long strips of cucumber. Toss the salad in a dressing – at The Tasty Ski Company we use a nice sweet house dressing. Add the prawns and serve with a slice of lemon. Delicious!